Saws and Slaws » Bring on Summertime! 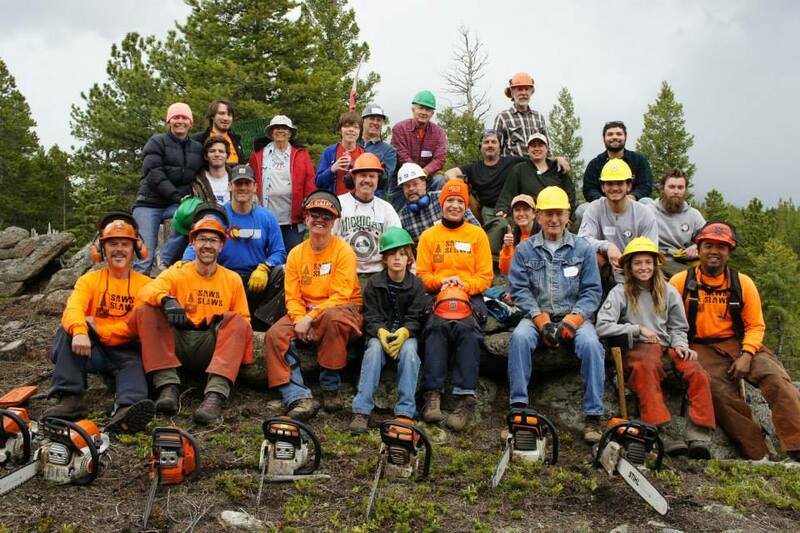 Saws and Slaws hosted its first official and full event for the season in May. Thanks to the combined efforts of the good people at Blue Sky Mountain Ranch, blueskymountainranch.com, Saws and Slaws folks from Coal Creek Canyon and Sugarloaf, Volunteers from AmeriCorps and Whispering Pines Church, we were able to treat about an acre of forest with 8 sawyers and 16 swampers! We reached a total of 106 volunteer hours in the event. Even though we are getting into the full summer season, weather was a factor at our May event. We learned that we need to keep tabs on it and make sure we communicate well with the participants about the status of the event if it is threatened by bad weather. 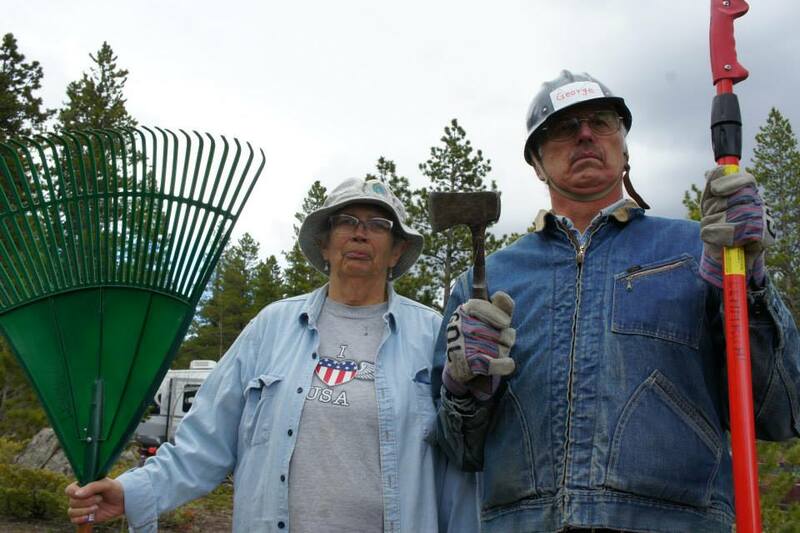 Kevin and Jennifer Russell, the owners of Blue Sky Mountain Ranch, hope to be our Saws and Slaws champions for the Gilpin County area. As champions they will manage planning the events for the Gilpin County neighborhoods near Rollinsville. This allows our program to expand to other communities while still supporting our own. Our vision just keeps expanding its reach! At these events you will drop off your slash which will be chipped and hauled away after the collection weekend. Needless to say, slash and slash piles are fuel for wildfires! Getting this material out of our forest benefits the health of our trees and helps our firefighters. Every little bit counts and this is one of the ways to dispose of this materials. Slash includes tree branches, limbs, tops, small logs and other tree debris. No tree stumps will be accepted. Please keep the materials at a maximum length of 8 feet and a maximum diameter of 6 inches. You may bring pine needles, but they MUST be bagged. Each load will cost $20. A load is counted as a truck bed filled up to cab height OR a trailer up to 8’x4’. Anything larger will be charged as multiple loads. ONLY CREDIT CARDS will be accepted for payment. The fees help offset the costs associated with chipping and removing the material. 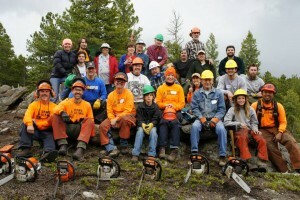 Our scheduled June Saws & Slaws event is scheduled for Saturday, June 13th. We will be in the Indian Peaks neighborhood near Wondervu. 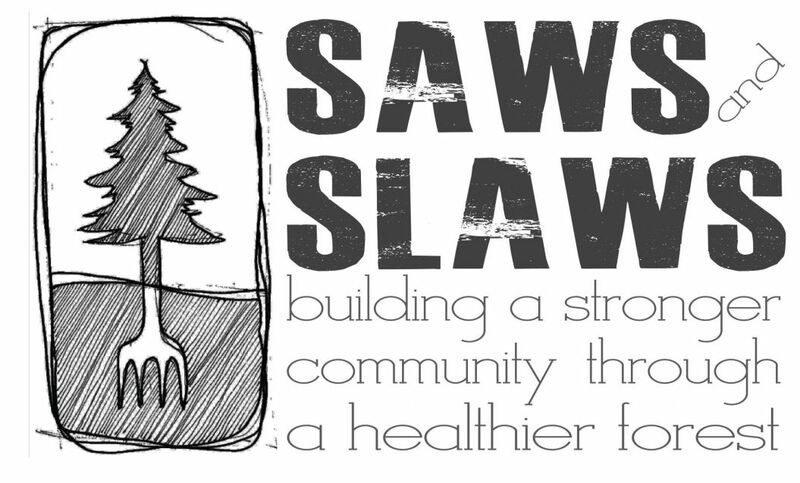 If you are interested in participating, sign up on our website or Facebook page: www.facebook.com/SawsAndSlaws Any and all are welcome. We are sure to have a job for you! 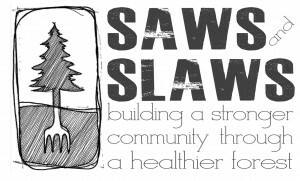 Please feel free to contact us on our Facebook page or via email (sawsandslaws@gmail.com) if you are interested in participating in any capacity. This is important work, and we’d love to have you be part of it. Thank you!